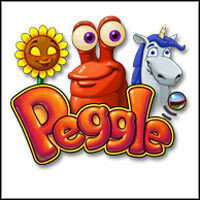 Peggle Deluxe is a game for players of all ages. It was developed by PopCap Games and it was distributed digitally. The rules of Peggle Deluxe are simple. The players must launch a ball in such way that it bounces from the environment and takes down other balls, scoring points. In order to beat a level, the ball must hit all orange pegs on the level. At first, the orange pegs are not moving and hitting them is easy. However, later they start to move and become better hidden under other blue pegs. There are bonus pegs on the levels as well. They can activate bonuses like a second ball or an arrow that presents the trajectory of the ball. Peggle Deluxe features 55 main quests that are completed one after another and 75 challenges that take place on varied levels. Each map features different design and placement of pegs. During the game, the players can use the help of various creatures that provide different help. The points can be obtained in a few ways – the simplest one is taking down a peg, but there are also bonuses for hitting a few pegs with a single shot or for placing the ball in a special basket that is moving under the level. Such action is awarded with an additional shot. In addition to campaign and challenges, Peggle Deluxe features a Duel Mode in which two players can face each other in local multiplayer. The graphics in Peggle Deluxe are colorful but schematic – they were based on simple animations. Special effects that appear during key moments like hitting the last peg or placing the bar in the basket are very important. The soundtrack is worth mentioning – during the game, the players can listen to the simplified versions of classics like Beethoven’s Ode to Joy and Edvard Grieg’s Morning Mood. Game score 7.95 / 10 calculated out of 97 players' votes.